This week I took on cleaning with Aunt Fannie’s Food-Based Cleaning Vinegar for a healthy home as part of a sponsored post. I would like to say that I am organized and reserve a set day of the week for cleaning. In my perfect world, this would be the case. Instead I try to do a little each day and pat myself on the back if I get one room fully cleaned. I will admit that it is a big easier these days since my kids are in school full time. The first time I’ve had whole days to myself in 14 years! I’ve slowly been going through the kitchen. Sorting and scrubbing each drawer and cabinet. What a chore! I have my donate box next to me and it is filling up fast with glasses and plates and other misc items we haven’t used in months. After I’ve cleared out the space, I spray it down. I have a new cleaner that I’ve been using for this task and I’ve really come to love it. Aunt Fannie’s was born when a worried father didn’t understand why his son continued to be sick. He was diagnosed with many allergies and food of course was the first thing they changed. But his boy still wasn’t completely healed. Why? 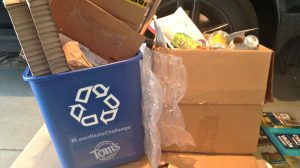 He was still breathing in harmful chemicals from conventional household cleaning products. Dad then went on a mission to a develop a non-toxic, first ever, food-based cleaning product. It makes sense, right? Chemicals weren’t always in our products. In the good ole days everything was made from nature. Aunt Fannie’s was evolved with that thought – using garden grown herbs and fruits. Eucalyptus, Fresh Lime Mint, Aromatic Lavender, Sweet Mandarin. The cleaning vinegars smell AMAzing for this type of product! When I normally use vinegar based products I can smell it and can live with it because I know it is healthier, but with Aunt Fannie’s the scent is great. I can very slightly smell the vinegar, but it is not over powering at all! Now let’s talk about those dirty, disease-carrying, fruit flies in our kitchen. Isn’t it hard to keep them away? They spoil our food! And are just plain gross. 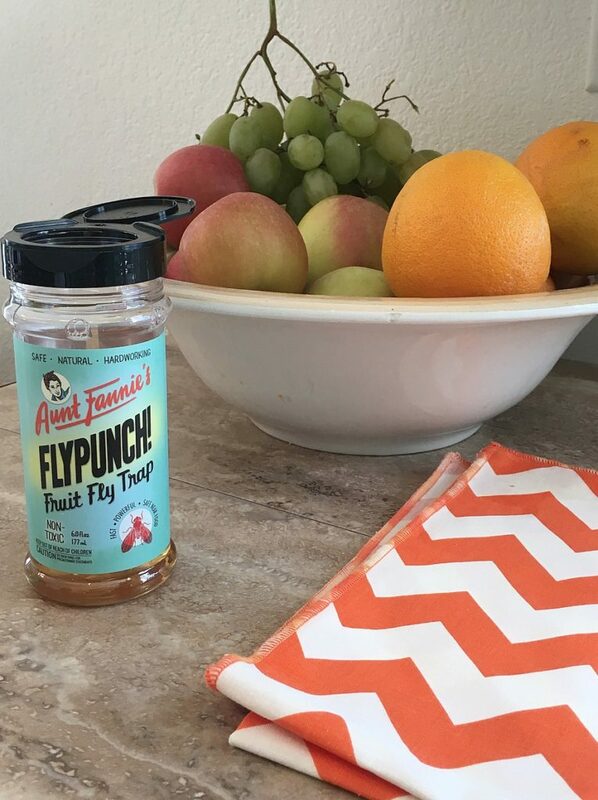 Aunt Fannie’s Flypunch is another fabulous, totally safe product I want to tell you about. Unseal the jar and keep it wide open sitting next to your bowl of fruit or wherever your problem is. Leave it there for up to a month and watch it collect those little pests! It is so effective a university research team has found it kills up to 544% more fruit flies than comparable products. The best part is that Flypunch is also non-toxic. Made only from natural concentrates with no poisonous ingredients, like all of Aunt Fannie’s products. Created with our families in mind. “If food can nourish our bodies, why can’t it nourish our homes?” Aunt Fannie asks. 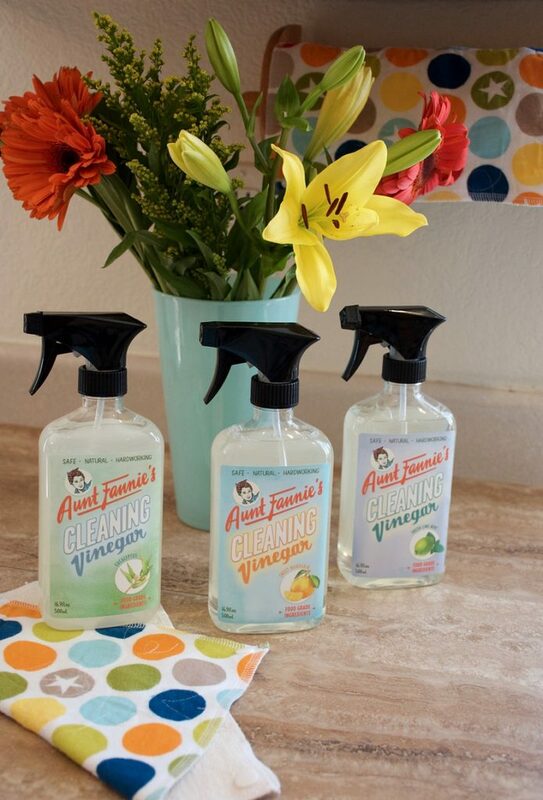 Start rethinking cleaning and pest products through food-based Healthier Housekeeping solutions from Aunt Fannie’s. Find their products in retailers like Whole Foods nationwide and online via Amazon and Thrive Market. Shop AuntFanniesCo.com and use code: beachmama for 30% off! Free Shipping too! Offer expires 10/31. 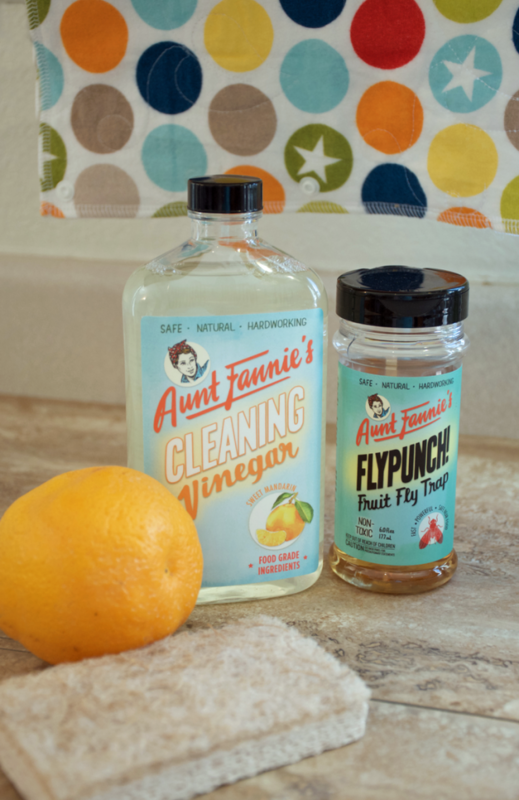 WIN Aunt Fannie’s Cleaning Vinegar and FlyPunch! I partnered with Aunt Fannie’s for this sponsored post. All opinions are my own. This giveaway will end on October 17, 2016 at midnight MST. Winners will be drawn via rafflecopter. Once a winner is drawn I will contact them and they will have 48 hours to reply before I draw a new winner. Giveaway is open to anyone in US and you must be 18 years of age or older. Giveaway not affiliated with Facebook & I release them of liability. Winner will be posted in the rafflecopter widget. been looking for something exactly like this! hope i win! looks so great! I would like to try AuntFannie's cleaning vinegar. I would love to try these. I like that they are non-toxic and sounds like it would smell nice. Thank you! I think the ingredients are listed incorrectly. Is vinegar the primary ingredient? I would love to try Aunt Fannie's Cleaning Vinegar and FlyPunch to get rid of pesky fruit flies. I like to use cleaners that are natural and safe for my family. This cleaner sound great! All natrural,no chemicals! I'm really wanting to try these, especially the fruit fly trap....I just threw away a bunch of bananas because of them. I like that it has No vinegar smell. I have read and heard many good things. I would love to try this. I would like to try these products just because the packaging is so darned cute! I love teh idea of safer cleaning products. The Eucalpytus sounds like a scent I would love too! Ohh, these products look amazing. We so need the FlyPunch. I love that it's safe for food contact surfaces. Thanks! I need something for those pesky flies that have been annoying the heck out of me! I need the fruit fly trap! These seem like great products. Inwill definitely be interested in this. I've never tried Aunt Fannie's cleaning vinegar before, but it does sound pretty great. I really like that it's safe, has no vinegar smell, and is 99% effective against germs. I am a cancer survivor and only use product my family can be safe with. NON TOXIC IS SO IMPORTANT! Interested in giving this a try! I think their products sounds awesome! I could really use the fly traps! I like using natural products. I would like to try the fruit flypunch. Hate those little annoying things. Many household cleaners are very toxic and unsafe especially around children. I like that the trend is turning to safer and more natural cleaners. I would love to try Aunt Fannie's products! I am happy she had the ability to add the scents to vinegar. I can't stand the smell of vinegar, so I could never use or eat it. I would really like to try 2 of these. I am highly allergic to eucalyptus, but the other 2 would be great. I am interested in trying the FlyPunch! DiveJars in our chicken coop. I haven't tried Aunt Fannie's products before. I would love to try the Aromatic Lavender scent though! I would love to try these,vinegar has so many great uses! I already use vinegar for a lot of my cleaning. These products definitely interest me. I would like to try the Sweet Mandarin scent. I would love to try Aunt frannies for my glass tile in the kitchen. I read you are supposed to use vinegar and that it works well. I am loving Aunt Fannie! I really love the fruit fly trap. I hate those things aad I always have them!! Vinegar is awesome for cleaning so I would love to try this. I Like that there is no vinegar smell. I like that they come pre-scented and no EOs need to be added on the consumer's end. I think that these Aunt Fannies Vinegar products are fabulous! We deal with so many chemicals in our day to day lives, and it's really nice to find a safe, natural cleaning product...less is definitely, better! Wow need to try these out! Always on the look out for new all natural cleaners! I would like to try the lime mint cleaning vinegar. I use vinegar right now but haven't scented it. I love this!! I hate using products full of chemicals! I am very interested in trying Aunt Fannie's. I have always used vinegar as a cleaner but up until recently I didn't know there was a vinegar specifically for cleaning. I love that Aunt Fannie's comes in different fragrances. I am definitely interested in trying out the products. If it's safe & natural, its for me ! this is awesome! we love natural cleaners, and being in a new home we are super motivated to keep it nice. I like it - I think that the labels are fun! I use vinegar all the time as a cleaner. I appreciate not using harsh chemicals. This time of year a fly trap would be a needed household accessory. I would like the FlyPunch! These products sound wonderful and I would love to try them! I think they sound awesome!! I already clean with vinegar and I'd love to try flavored ones, especially lime/mint. 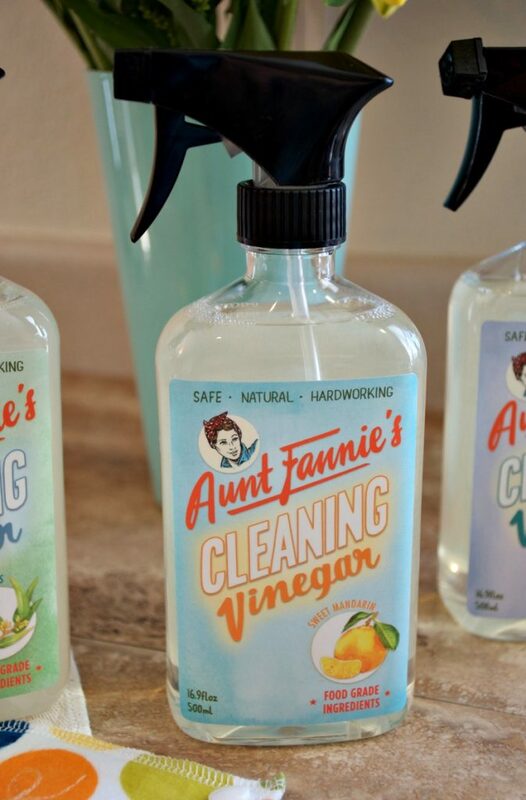 Aunt Fannie's sounds like a great grenn cleaner and I am anxious to try it! Aunt Frannie's sounds great! I love that its safe for food contact surfaces and my DH will love that it doesn't smell like vinegar! I think this is a great idea. I use vinegar in cleaning a lot, and it would be nice to have a product that doesn't have that vinegar smell. I had never heard of this brand before. It sounds ideal for me. I have been using vinegar, water and baking soda to clean for a while now. If I use any harsh or bleach based chemicals, I get physically ill and have trouble breathing. I'd love to try all of these products. Thanks for the chance! I love cleaning with vinegar but my lover man complains about the smell. I'll check this out for sure! I only use vinegar to clean my home and my friends always teases me about the smell anyways I would love to try these! I have those little gnat things all the time I could really use the punch. I really like their Fruit Fly Trap. They have been pretty bad this year. I would love to try this! I think vinegar is great for cleaning but sometimes that smell is too overpowering. I would love to see how these compare! This is my first time hearing of Auntie Fannies. I like that the products are safe and natural, but I am wondering if this stuff couldn't be made at home for cheap. I love that these are all natural products and they don't smell like vinegar. I would like to try the FlyPunch! DiveJars. I have not heard of Aunt Fannie's products before. Thanks for the review. I like that it's a safe and natural cleaner. What struck me was the phrase: Food-Based Cleaning Vinegar. I like that they use essential oils in their products. Thanks for the contest. I love the using natural cleaners in my home. I am new to this brand, but would like to try it. I think this is a great idea. I clean a lot of things with vinegar, but have the same problem as you - it has such an overpowering scent! I'd love to try out the Aunt Fannie's and see how the scents mask the vinegar odor. I think the products are great because they are all natural and don't use chemicals. It sounds like it is safe and a great natural product. I would love to try it and see if it works well and smells good. I love that it's going to smell good and it's 99% effective against germs too! I'm always interested in safer products so I'd love to try these. I'm glad to find a product that is natural and so very effective. I'll be looking for this to add to my cleaning products. I used to have a lot of extra cleaning products at home, especially when the kids were younger. After I learned that vinegar was just as effective, and much cheaper, I tossed pretty much all the others by the wayside.